Leading manufacturer of gel and foam-filled comfort flooring (more than 3 million mats sold) introduces entry-level gel comfort mat to its product lineup. The GelPro Basics mat joins the GelPro Elite luxury comfort mat, now available in more than a thousand colors and patterns. The new GelPro Basics mat is perfect for someone who wants great support and comfort in the kitchen at a lower price point. GelPro®, the market leader in innovative gel and foam-filled comfort flooring, introduces the new GelPro Basics Comfort Mat, an entry-level gel comfort mat using similar patented technology of the best-selling GelPro Elite at a more affordable price. With more than 3 million mats sold, GelPro offers floor mats with the most advanced comfort technology for home, office and medical uses. Designed to protect feet, legs and backs from discomfort and fatigue, the new Basics Comfort Mat features a slightly thinner comfort core of patented gel and energy-return foam than the one used in the best-selling GelPro Elite luxury mat. 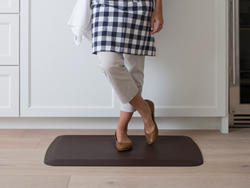 Like the Elite mat, the Basics Comfort Mat has beveled edges, a stain-resistant top surface made of non-toxic polyurethane, and a slip-resistant bottom surface. Available in a 20 inches x 32 inches mat, GelPro Basics comes in two patterns, Woven and Basketweave, and several colors. For sale online at GelPro.com and Amazon.com, it retails for $64.95 and comes with a three-year warranty. GelPro is also introducing, for the first time, the NewLife® Complete Comfort® Seat Cushion for hard kitchen, dining or office chairs. This stain-resistant, easy-to-clean seat cushion is covered in non-toxic polyurethane. Made from energy-return foam, the Complete Comfort Cushion provides extra-plush comfort and maximum support. Available in two colors of the vintage leather pattern, the two-cushion pack retails for $39.95 at GelPro.com and Amazon.com and comes with a three-year warranty. These new products join GelPro’s extensive portfolio of residential, commercial, and medical products, which are manufactured in Waco, Texas. GelPro comfort mats are sold direct at GelPro.com and at national retailers, including Bed Bath and Beyond, Wal-Mart, Target.com, Staples.com and Amazon, as well as many kitchen specialty stores. The company will feature both the GelPro Elite and Basics mats at the 2018 International Home + Housewares Show, Booth #S4245, March 10-13, in Chicago at McCormick Place, 2301 S. Lake Shore Dr.